After upgrading to the newly released Pro Tools 9, I couldn’t open sessions or create new ones. I got this error: “Could not complete the Open Session… command because Pro Tools could not set sample rate to specified value..” I hunted around on the web and various forums, but couldn’t find a solution that fit. 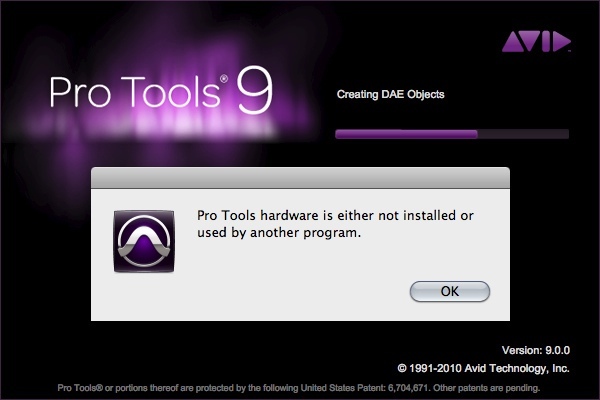 I found several items relating to Windows and Pro Tools 8, but nothing for a Mac running Pro Tools 9. After messing around a bit I figured out the problem was with my playback engine. Here’s how I solved it. Let me know if it works for you too. Open the Playback Engine dialog under the Setup menu item. From the menu bar select Setup > Playback Engine… to open the Playback Engine dialog window. The problem is with the Pro Tools Aggregate I/O. By default, my current engine was set to “Pro Tools Aggregate I/O.” It’s odd that this Pro Tools would leave it that way after an installation since AVID states that it is not supported in OS X. 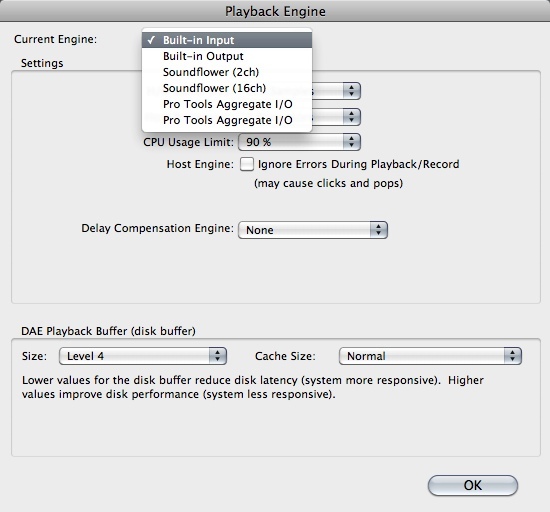 Select your current playback engine. The fix is easy. Simply select the right playback engine. Your options may differ based on your setup. In my case, I usually would edit with my Mbox 2 Micro, but since Pro Tools 9 gives us so many more options for hardware compatibility, I selected Built-in Output. I was able to edit some vocal takes using my Macbook Pro’s speakers instead of pulling out my headphones. Nice!